Pinch of Cinnamon | Spicy stories and recipes from around the world: Tom yam kung. Home made. To start with, Tom Yam is a traditional Thai prawn soup. Its two key flavors are hot (spicy) and sour. Good tom yam is deep red and tastes intensely of roast chili peppers. 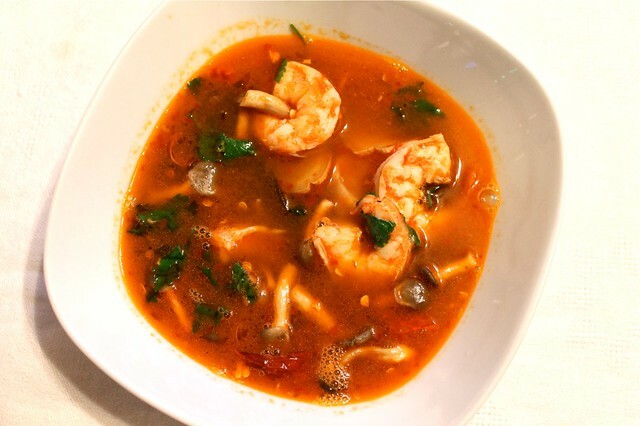 Essentially tom yam is simmered prawns and mushrooms in a special browth (that's what all the cooking is about). And of course now there are all kinds of variations available (like fish or chicken tom yam, or coconut broth). I have to say it turned out to be not at all difficult. Most of effort went into getting the ingredients right. To this Thai food blog - SheSimmers - I owe lots and lots of findings relating not to tom yam only but to pad thai and other Thai dishes. It turned out that one of the most important ingredients, which gives the soup its red color, level of heat and sweet peppery taste is Nam Prik Pao - a special paste made of roasted red chillies with oil and shrimp paste. My main speciality store for tom yam was Indian spices store. It used to be almost the only one in Moscow before another one (Китайские продукты) opened recently, which I didn't yet get to visit. It took me some time to find the right chili paste at the store (there were obviously many kinds from all the Asian countries available). Finally I found the analogy for Nam Prik Pao because I knew it had to be produced in Thailand, to have shrimp paste in and to look almost like thick jam - "Chilli paste in soya bean oil" produced by AROY-D. It makes you want to try it once you open the jar. Be careful, though. I just leaked a teaspoon, that had some oil left and even with my chilli tolerance it felt very spicy. Another ingredient that troubled me somewhat were the mushrooms. Tom yam needs white mushrooms for which I don't even know the translation into Russian (let alone finding it in the stores). It turned out though that a very close analogue are oyster mushrooms (вешенки), which are really widely available. The rest, like fresh lemongrass, galangal root, kaffir lime leaves and fish sauce etc, are readily available from Indian spices store. I had some thinking around the stock too. Many recipes, including the one from SheSimmers call for chicken or even pork stock. I have no idea whether this is right or wrong, but for me that just doesn't work. Why would I make such a great soup, which is all about shrimps with a complete outside stock... So I made my favorite shrimp stock, which is cooked from shrimp shells and heads fried to bright red crisp. As I said, when you get the ingredients, it is all very easy. You just keep the broth lightly simmering and add the prepared ingredients one by one. Pure assembly job, just don't overcook. Everything needs to infuse the stock and get a little light cooking. Peel and devein the shrimps (keep the heads and shells) and set them aside. To make the broth heat the oil in a medium pan. Add the shrimp shells and heads and cook them stirring until pink. Add the water and simmer for about 45 minutes. Strain. Pour the broth in a clean medium saucepan and bring to a very gentle boil over medium heat. Keep the temperature low. Add the lemongrass, galangal, and kaffir lime leaves to the broth. Add the mushrooms and stir in Nam Prik Pao. Add the fish sauce, followed by the dried chilies. As the broth is gently simmering, lower the shrimps into it. Monitoring the temperature, so that the broth keeps gently simmering. Give the shrimps a couple of stirs. Once the flesh has firmed up and turned opaque, remove the saucepan from heat. Off the heat mix in the coconut milk if using. Season the soup with the lime juice. Taste. Add more fish sauce or lime juice as necessary. Stir in the cilantro leaves and serve the soup piping hot. Can be served as a main course (with rice) or on its own as a starter. Super hot! We love it! Great recipe!! !